Source: Originally attested, per the 1915 Nominal Roll, as a Sergeant. Was promoted to Temp. Lieutenant May, 1916 (per War Diary). Citation for Distinguished Service Order. 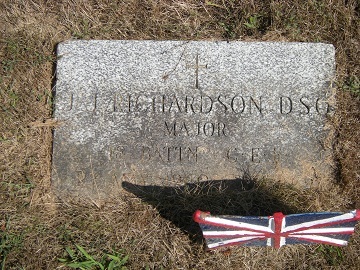 Lt. John James Richardson, Inf. For conspicuous gallantry in action. When his senior officers had become casualties, he led his men with great courage and determination to the final objective, and consolidated the position. Later, he captured many prisoners. Source: London Gazette issue 29824 page 11044 dated November 14, 1916. Source: May 1916 War Diary. May 26th was promoted to temporary lieutenant. Attested as a Sergeant and rose to rank of Major. Headstone at Preston Cemetery, Cambridge Ontario. Died May 27, 1960. Time: 9.41 am. Reference: 4th C.I.B. War Diary Appendix 109 dated September 15, 1916. Message: Am building second line connecting shell holes 50 yards in rear of front line. Mr. Lloyd[ii] with B. Co. is looking after this. I myself have parts of A, C & D companies in front line. [iii] Have one Machine Gun (Boche) but don’t know how to work it. M.G. organization not very good, otherwise everything alright. Have good connection with H.L.I. [iv] on right and 20th Bn. on left. [i] Lieutenant J.J. Richardson was to earn the Distinguished Service Order. His citation reads: For conspicuous gallantry in action. When his senior officers had become casualties, he led his men with great courage and determination to the final objective, and consolidated the position. Later, he captured many prisoners. Source: London Gazette issue 29824 page 11044 dated November 14, 1916. [iii] This is an interesting statement by such a junior officer. It may indicate that the more senior officers of those companies have been disabled and he has assumed overall command of the companies due to casualties. [iv] 10/11th Battalion, Highland Light Infantry of the 15th Scottish Division. On the 18th Battalions right.